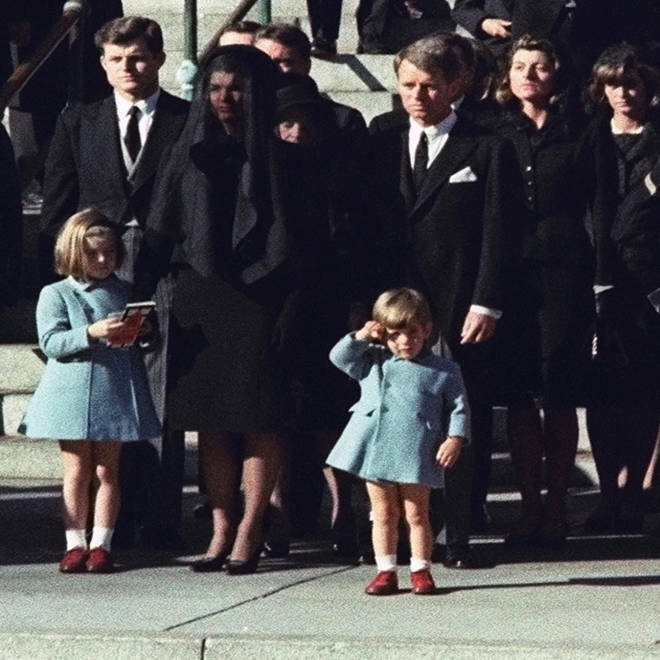 3-year-old John F. Kennedy Jr. salutes his father's casket in Washington on Nov. 25, 1963, three days after the president was assassinated in Dallas. Few tragedies loom as large in the American psyche as the assassination of President John F. Kennedy, who was gunned down in Dallas a half-century ago today. Now, we pause to remember that dark day in the country's history — recalling a shared trauma that can feel both political and personal. Lester Holt reports from Dealey Plaza, where President John F. Kennedy was assassinated 50 years ago. "I remember it as if it were yesterday," President Bill Clinton told NBC News' Tom Brokaw earlier this year. "He meant something to the country and he symbolized the future. And it was as if he was snuffed out." It was raining in Dallas on the morning of Nov. 22, 1963, when Kennedy and First Lady Jacqueline Kennedy touched down at Love Field amid a five-city swing through the Lone Star State. But the clouds soon cleared, and the day began as a bid to boost Kennedy's re-election prospects in right-leaning Texas. 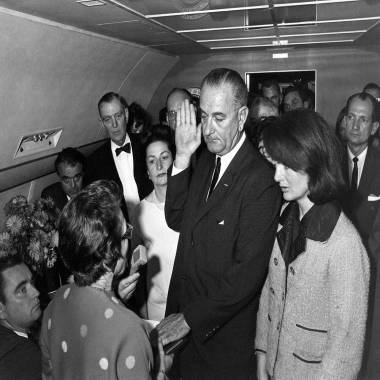 It ended with Vice President Lyndon Johnson being sworn in on Air Force One — with a stunned, stricken widow at his side. The events of that day crushed Camelot and felled the New Frontier, silencing a princely president who had inspired a divided nation with soaring speeches and daring dreams. And, for many Americans, the assassination spelled the start of a great unraveling, setting off a decade of bloody upheaval and burning unrest that stretched from Selma to Saigon. "We just literally went from childhood to adolescence — and it was an ugly adolescence," Mike Kettenring, a former New Orleans-based reporter turned priest, told Brokaw. Judge Sarah T. Hughes administering the Presidential Oath of Office to Lyndon B. Johnson aboard Air Force One. For the last month, NBC News has explored the legacy of the Kennedy assassination — from the mysteries surrounding Lee Harvey Oswald, the man officially held responsible for gunning down the president, to the most compelling conspiracy theories that have become part of national mythology. And now, with the 50th anniversary of the Kennedy assassination finally upon us, here is a snapshot of some of the memorials and tributes taking place across the nation Friday. Thousands of people are expected to flood a free event at Dealey Plaza, which is bounded by the Texas School Book Depository building where accused assassin Lee Harvey Oswald fired three shots from a 6.5-mm Mannlicher-Carcano rifle from his perch on the sixth floor. The somber ceremony will include short remarks from Dallas Mayor Mike Rawlings, the tolling of church bells and a moment of silence at 12:30 p.m. — the moment Kennedy was fatally shot. A monument on the infamous grassy knoll is slated to be unveiled during the mayor's speech. The organizers behind the gathering wanted to wanted to put emphasis "in a positive way more on the legacy of President Kennedy," Rob Kirk, a former mayor and a member of the planning committee, told the Associated Press. 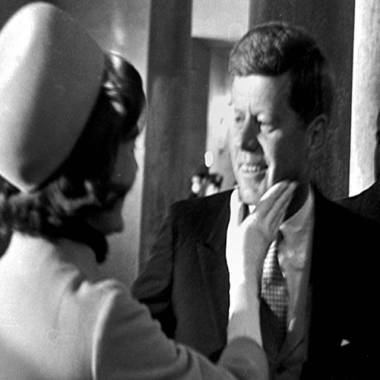 John F. Kennedy was the youngest man ever to serve as U.S. president. Click on the gallery for photos detailing key moments in his campaign for the White House, his brief time in office, and his untimely death. Roughly 5,000 tickets were issued for the "The 50th: Honoring the Memory of John F. Kennedy," which will also feature readings from the famously erudite president's public addresses by author David McCullough. In a tribute to the slain president's military service, the U.S. Naval Academy Men's Glee Club will sing "The Battle Hymn of the Republic," followed by an Air Force flyover. Dallas will also host other events on the occasion of the auspicious anniversary, including a ceremony at Parkland Memorial Hospital, where Kennedy was declared dead, to lower the American flag to half-staff, according to the AP. Meanwhile, in Fort Worth, the city's Chamber of Commerce will host a breakfast at the hotel where Kennedy delivered his final speech — and spent the last night of his life. The JFK Presidential Library and Museum in Boston — just a short drive from Kennedy's birthplace in Brookline, Mass. — will unveil a small exhibit of never-before-displayed artifacts and tokens from the president's state funeral and host a musical tribute that won't be open to the public. "It's 50 years later and it's also a moment to look forward to the future," Thomas Putnam, executive director of the library, told the AP. "We want our tone to be respectful and we want it to have a certain reverence, but we also want it to be hopeful and end on this notion of what JFK stood for." According to the library's website, some of the priceless items on display include: the American flag that was laid over the president's coffin and was later presented to his widow; the saddle, sword and boots from Black Jack, the riderless horse that accompanied the president's horse-drawn coffin in the funeral cortege; the Green Beret placed by a serviceman on the president's gravesite; and historic film footage and photographs of the state funeral. The full special edition of Meet the Press featuring three interviews with then-Senator John F. Kennedy during the 1960 presidential campaign. Washington, D.C.: "44" honors "35"
President Barack Obama, the 44th president, will meet privately at the White House with leaders and volunteers from the Peace Corps program — an iconic American program Kennedy established in March 1961.